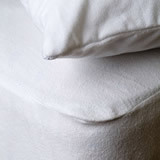 Waterproof Pillow Protectors - View our range of Waterproof Pillow Protectors here at Anthony Ryans linens shop, offering excellent quality Waterproof Pillow Protectors to suit your needs. Most waterproof pillow protectors have a terry towelling cover with a hydrophilic layer that does not allow any liquid into the mattress. However, Micro-pores allow the air to flow through making it completely breathable which is very important for a comfortable night’s sleep. Here at ShopLinens we feel it is vital to ensure your waterproof pillow protector is anti-bacterial and anti-allergenic giving complete protection against dust mites.